I am happy to announce that canned pumpkin is back on the shelves at the grocery store! Halloween decorations are popping up all over the neighborhood and to celebrate autumn, and the return of canned pumpkin, I decided to make the first pumpkin pie of the season. When we bought our house, I was excited to be able to decorate the outside for all the holidays. Since fall is my favorite season, I took particular interest in jazzing up the house’s curb appeal with pumpkins, gourds and corn stalks. However, my excitement was short lived when I discovered what a ruckus the décor would cause among the local squirrel community. They began by scaling the corn stalks in search of leftover ears, which they then threw to the ground and began to fight over. But that was only the beginning of the commotion. Next, they set their sights on my pumpkins. They chewed a hole into the side of each pumpkin, large enough for their rotund little bodies to fit through, then sat inside the bulbous food pit and ate it from the inside out. There was only room for one fat squirrel at a time so some serious fights ensued at the front door of the “restaurant.” These brawls were often so loud that it sounded as if they were taking place in a ring right in the middle of my living room. This, of course, drove the dog nuts. From his perch on the ottoman beside the front picture window, he barked and growled with such gusto that I knew it was only a matter of time before he crashed through the glass to join the scuffle. Needless to say, that was the end of the autumn decorations in the front of the house. In order to keep peace in the neighborhood, the pumpkins were discarded and the cornstalks dismantled. But, there is a way that I can enjoy pumpkins every year without the disruption of rodent and canine confrontation – pumpkin pie. 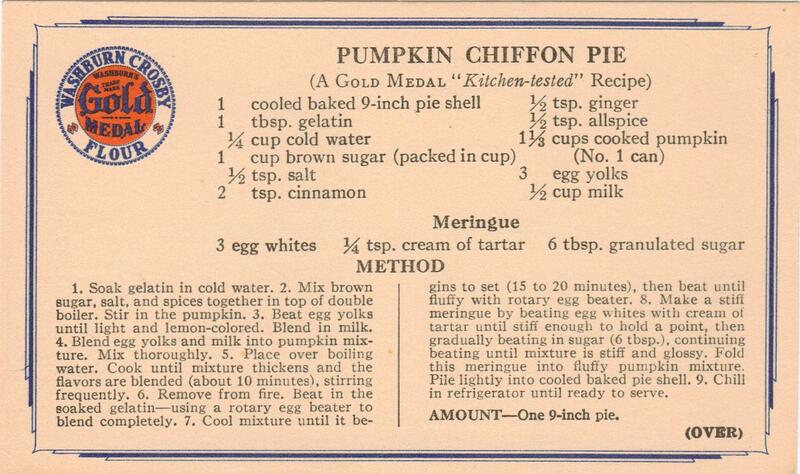 There are three versions of the pumpkin chiffon pie recipe in the box. I made one last year for Thanksgiving and it was my first introduction to this fluffy and extraordinary pie. 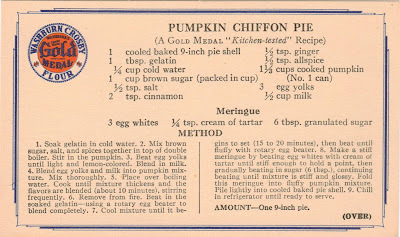 I have always been a huge fan of pumpkin pie, but the chiffon version just might be my new favorite variety of this traditional dessert. This version on the second card from the box is deliciously rich, it’s as if the spices all gather hands and do a little square dance right there on your tongue. And the filling itself is so light and fluffy that it leaves you feeling refreshed and satisfied, not stuffed liked the Thanksgiving turkey. I actually had enough filling to make two 9-inch pies: one with a traditional crust and the second with a graham cracker crust. Murphy was excited because this meant that the second pie would become a special delivery to his best friend next door, our neighbor Wayne. As soon as he looked at the pie, Wayne’s eyes filled with tears. “I love pumpkin pie,” he said, “and I just had my first piece of the season tonight at dinner.” Then he lovingly clutched his gift in his hands and went inside to find a special place for it in his fridge. As we walked away, my eyes, too, filled with tears. This project has come to mean so much to me over the past year. Not only has it given me the chance to learn so many things about cooking and heirloom recipes, but the act of writing about them has also given me the chance to see the process, and my life, from a different perspective. But for as wonderful as that experience has been, nothing beats seeing the glow on someone’s face when you hand them something you made especially for them from scratch in your kitchen. It seems like such a simple act, but sometimes, that little thing can mean the absolute world to someone. The holiday season is quickly approaching, which means schdules will soon be packed and time will feel as if we’re living in fast-forward. Before life gets too crazy, I encourage you to head to the kitchen and make a tasty treat for someone special in your life. Baking will momentarily take you away from your hectic day and the simple act of giving your creation away will fill multiple hearts with joy. It’s too bad that squirrels and dogs can’t cook or this would be a valuable lesson that could also be shared with Murphy and his bushy-tailed friends. Perhaps if they could sit down together and share a pumpkin pie, it would prevent any further cage matches from occurring on my front step. Oh well, I guess I’ll just have to keep the pumpkin decorations safe inside the house. At least Murphy gets to share his pumpkin pies with Wayne, I know that brings joy to both of their hearts. In my family, this pie is known as a "Peggy Springer" because it was a favorite of my grandmother's friend (of the same name). 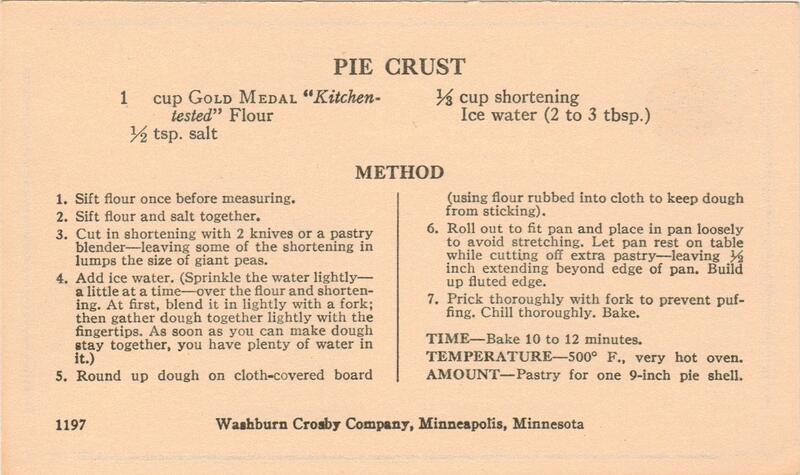 It was a staple at our family Thanksgiving for years, but sadly, with my grandmother's passing, it fell out of fashion. I do a lot cooking and this year, I decided to make a Peggy Springer myself. I used the recipe that my mother gave me, but the technique seemed off. 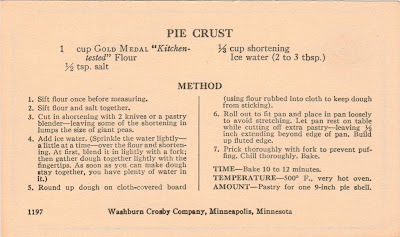 An internet search brought me to you, and I can see where my mother's copy of the recipe was mis-translated. Thanks for the original.